When it's time for you to target new potential customers in your local area, consider a Direct Mail & EDDM Campaign. Direct Mail and EDDM (Every Door Direct Mail) have been very successful for targeted campaigns in the past. We can target by household income, mail route, and zip code. If done correctly, it is a highly effective tool to reach new people who may be looking for your product or service. 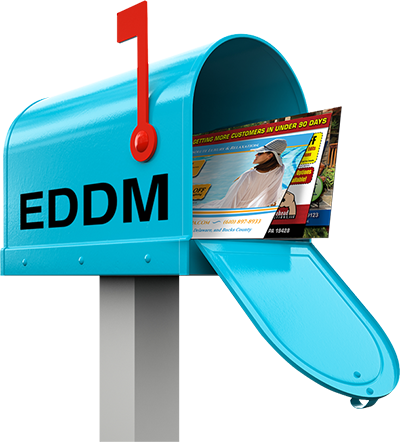 EDDM stands for Every Door Direct Mail, which is a class of postage offered by USPS that is cheaper than most other postage types, due to it being easier for the Post Office to deliver. EDDM postcards have an easier delivery method in that you can select mailing routes or entire zip codes so that every door in that area receives on of your postcards. Direct Mail, while similar to EDDM, is more specific targeting based on your preference. While EDDM can be as simple as selecting entire areas by mailing route or zip code, for Direct Mail you can purchase mailing lists that let you specify potential customers based on age, race, gender, income level, and other variable data. This will allow you to focus on potential customers that may be more likely to receive business from. Essentially, Direct Mail targets a specific demographic using mailing lists, while EDDM targets a specific geographic area without the need for mailing lists. Overall, EDDM postage will cost less than traditional Direct Mail. On the other hand, Direct Mail has a chance of a higher response rate due to more specific targeting (not guaranteed). Knucklehead Productions can help you every step of the way for a Direct Mail or EDDM Campaign. You can have us design your mail piece with consistency to your brand. We can get your postcards printed when the design is approved, we can determine the method in which you want to target your potential customers. If you would like to deliver your mailers by specific mailing routes, everyone on that route will receive one of your mailers. There are multiple options depending on who you would like to send your mailers to, where they're located, and how many you're sending out. We will get your EDDMs designed, printed and delivered in the quantity appropriate to target your potential customers. The professionals at Knucklehead Productions™ will work with you throughout the process to determine the best method of delivery depending on the goal for your mail campaign.